KEF E301 Satelite Speaker. Balanced crossover, cabinet and drivers. Uni-Q array: 0.75" HF, 4.25" MF drivers. . SOLD AS A PAIR. The E301 satellite speaker was designed from the start as a single perfectly balanced system with the crossover, cabinet and drivers working together in harmony. It features the latest iteration of KEF’s signature Uni-Q driver array. The less there is to intermediate the recorded signal, the clearer the sound. To eliminate secondary radiation and cabinet colouration, the enclosures are heavily reinforced with internal ribbing and damping technologies to ensure sonic accuracy with no unwanted resonances. The low diffraction cabinets are carefully engineered to minimise scattering of the output, so nothing subtracts from, nor adds to, the sound from the driver. The secret of the E301's outstanding hi-fi response lies in the latest iteration of KEF's signature Uni-Q driver array, originally developed for the multiple award-winning Q Series. With its famously wide dispersion characteristics and sonic purity, this technology is what gives the system its extraordinarily natural sound quality. Being stiffer than conventional materials, the aluminium midrange cone operates rigidly over the entire vocal range for the smooth, clear midrange response that reproduces the human voice with stunning accuracy. KEF’s Z-flex surrounding cone provides a smooth, uninterrupted surface over which the tweeter’s output passes with no disturbance or diffraction. 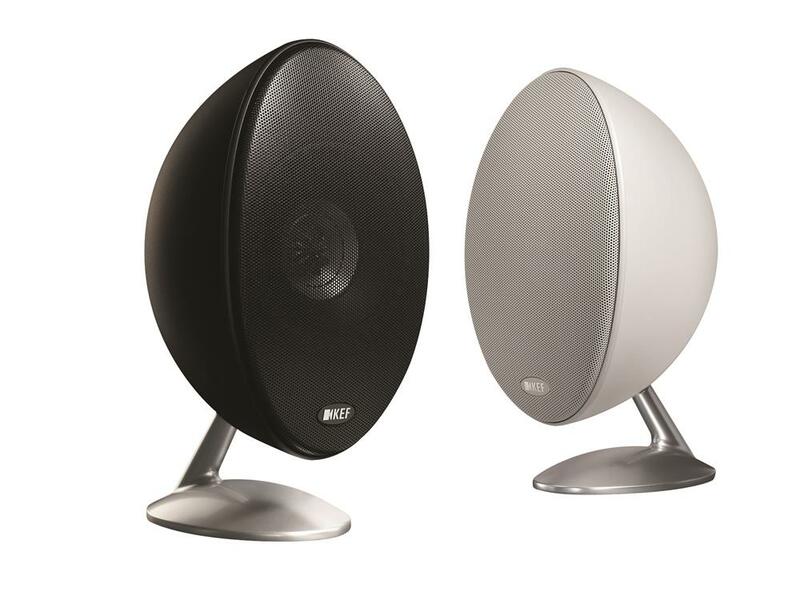 KEF's award-winning original KEF KHT2005 and KHT3005 'egg' system revolutionised home entertainment with its supremely accurate 3D sound from distinctive small speakers packed with unique technologies. Redesigned to take advantage of design innovations developed for KEF's most sophisticated audiophile speakers, KEF E301 raises the bar even further - at a surprisingly affordable price. Available in deep black or pure white, the silky matt finish is complemented by satin chrome cast aluminium bases that simply rotate to form wall brackets. Beautifully engineered bespoke stands are also available to help to position around in the listening environment. Everything about the E301 is designed to make life easier and more pleasurable. It's simple to hook up to any AV receiver which also controls the output level of the subwoofer. With no special tools or skills required, you'll set up your system for optimum performance in no time. Whether it's on the desk, on wall or floor stands, set-up couldn't be simpler.